Familiarize yourself with 3D printing software. This software may be specific to a particular brand or model of 3D printer. Familiarize yourself with a desktop 3D printer. Fabricate and operate a linear motor. Seymour Papert, Teaching Children Thinking. Three-dimensional (3D) fabrication involves the process of creating a solid object. This can be done in one of two ways: through a three-dimensional milling machine that removes materials from an object, or through an additive manufacturing process such as 3D printing. The majority of 3D printers currently heat and extrude a filament that is deposited on a build platform to create an object layer by layer. This introduction to 3D printing will provide an opportunity to fabricate an existing design. In the lab that follows, the process of creating an original 3D design will be addressed. Until further research is conducted and the effects on health are better understood, it is better to err on the side of caution. There are two ways to address this risk. One is by only printing in a well-ventilated room. An even better way is to use an enclosed 3D printer with a HEPA filter certified to remove nanoparticles from the atmosphere, such as the Afinia 400 3D printer. The examples below are drawn from use with an Afinia 400 3D printer, but can be adapted for use with any desktop 3D printer. 3D printing involves three steps: (1) loading the file, (2) placement of components, and (3) printing. 3D printer files have a standard format known as the stereolithographic file format. The word “stereo” refers to a solid or three-dimensional object, while the term “lithographic” refers to a method of printing that employs a limestone plate. The suffix for stereolithographic files is “.stl”. The first step in 3D printing is to load an .stl file into the program provided with the 3D printer. In this instance, Afinia Studio is the software provided with the Afinia 3D printer. It can be downloaded from the Afinia website. Figure 2.1 The orientation of an object can affect the success of a print. Most 3D printing programs provide a means of adjusting the orientation and position of each object on the build plate. 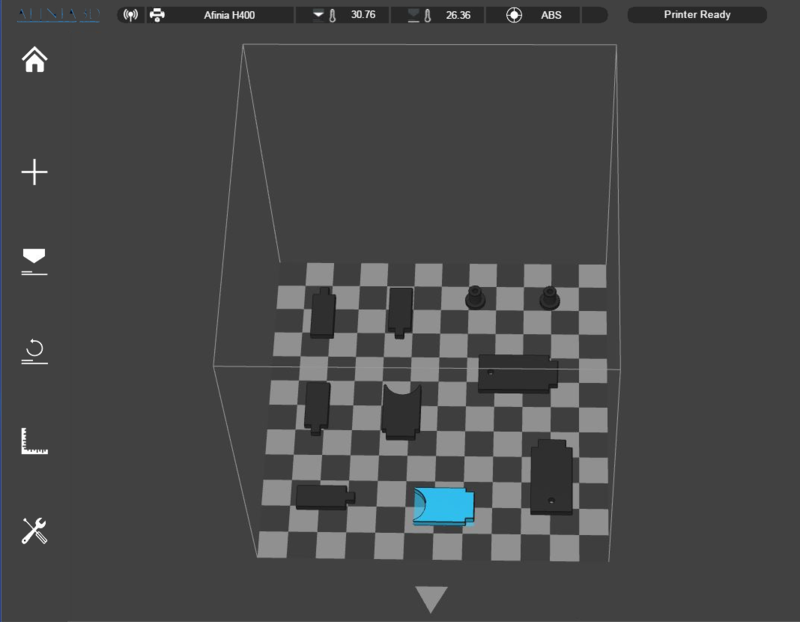 Adjusting the position makes it possible to print several objects at the same time. Adjusting the orientation of the object can affect the success of the print. 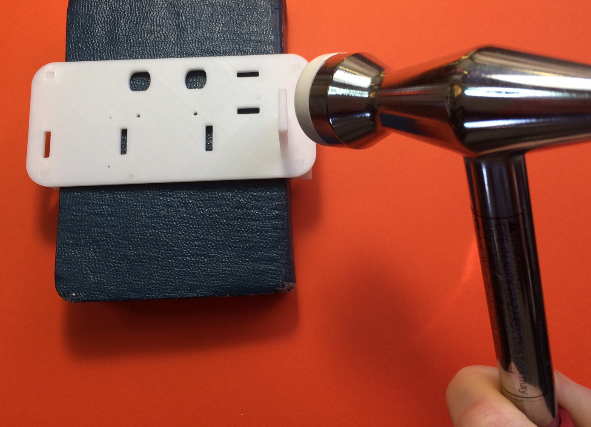 If an object has an overhang, 3D-printed support material will be needed to build the object. The support material will need to be removed after the print is completed. Therefore a tube with a flange at one end should be printed with the flange face down on the build plate so that support material will not be required. The Afinia Studio software has an Autoplace feature that automatically places the parts in an optimal position for 3D printing. This feature saves time and optimizes the printing process. Once the object or objects have been placed in the proper position and orientation, the file can be sent from the computer to the 3D printer. In some cases the 3D printer may be connected to the computer via a USB cable. In more advanced 3D printers, the computer may be able to connect via a wireless connection. The computer can be used for other tasks after the file is transmitted to the 3D printer. The 3D printing process is not a fast one. Even an object of modest size may require an hour to print, and larger more complex shapes may print all night before they are completed. One advantage of a digital die cutter is that a complex shape can usually be cut out in less than a minute. This makes it feasible for students to make multiple adjustments in a design in a single class period. In contrast, students will not usually be able to see the results of a 3D-printed design until the next class period. For that reason, it can be useful to develop a prototype of a design using a digital die cutter, and wait until the design is satisfactory to print it in more permanent form using a 3D printer. A variety of papercraft designs are available on sites such as the one hosted by Rob Ives. In a similar manner, a wide variety of 3D printer (stereolithographic) files are available on sites such as Thingiverse. 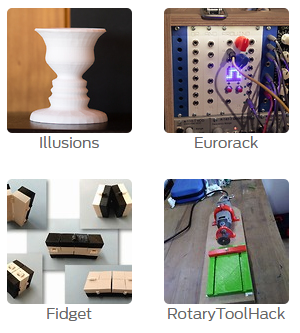 Figure 2.2 Files for 3D printers can be found on sites such as Thingiverse. The quality of the designs may vary. However, many of these files are available under a Creative Commons license that allows them to be used for non-profit applications without a fee. These sites can also serve as a source of inspiration for other designs. 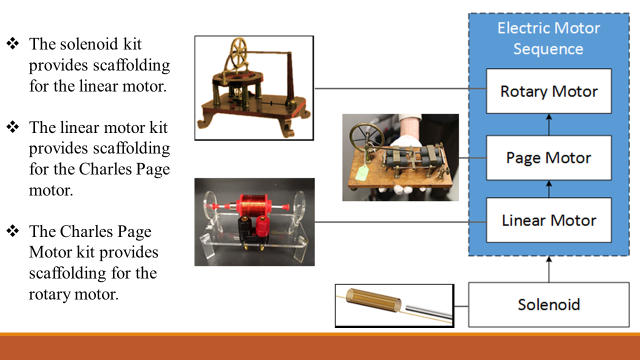 The competency for this lab involves fabrication of a 3D-printed motor. This design anchors a hands-on introduction to electricity and magnetism developed in collaboration with the Smithsonian. The linear motor provides an introduction to principles of operation of electric motors. This, in turn, provides scaffolding for reconstruction of historic motors such as the Daveport Motor patented in 1837 (U.S. Patent # 132). Figure 2.3 The linear motor kit provides scaffolding for reconstruction of historic artifacts. Figure 2.3 The assembled linear motor constructed from 3D-printed parts. The linear motor consist of the following components: (1) an armature in the center of the solenoid spool (this is the component of the motor that moves), (2) a solenoid spool (with wire wrapped around it) and two U-shaped solenoid support extensions on either side, (3) two solenoid support pillars used to support the solenoid spool (attached to the base), (4) two end pillars that limit the distance that the armature travels, and (5) a base with four feet. The black and red components at the front of the motor are electrical connectors. Because they have metal components, the electrical connectors cannot be fabricated with a desktop 3D printer. 3D printers that can print metal exist, but are extremely expensive. Therefore these components were purchased from an electronic supply house. 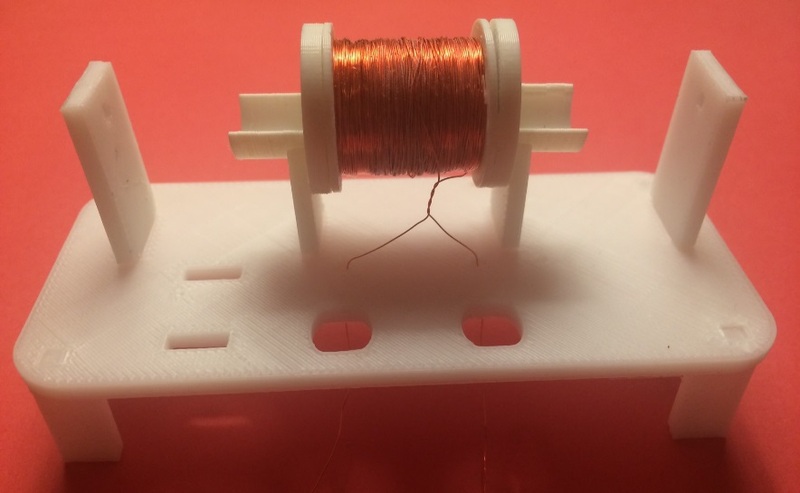 An .stl file is available for the solenoid spool, but it will not be necessary to 3D-print it because an injection-molded spool for the linear motor has been developed in the Machine Tools program at Midland Technical College in Columbia, South Carolina. The spool takes about an hour to produce with a 3D printer. Hence it is only feasible to print about fifty per week with a desktop 3D printer. In contrast, the injection molding machine can produce about 2,000 solenoid spools per day. However, the injection molding machine costs more than $100,000. Design of a mold for use with the injection-molding machine can cost $10,000 for commercial applications. Hence, development of an injection-molded version of a 3D printed object can only be justified when large quantities will be needed. Because Midland Technical College is a collaborator in the FabNet consortium, the students in the Midland Machine Tools program developed an injection-molded spool for the FabNet Linear Motor Invention Kit. When the Linear Motor .stl file is loaded, the parts can be placed on the build platform. Figure 2.4 The 3D printer software is used to place the parts on the build platform. All of the parts except for the motor base can be fitted onto the build platform for an initial printing. The base can be fabricated in a second print session. Once the file has been transmitted to the 3D printer, the parts will take about an hour to print. Once the build is completed, the build platform can be removed from the printer. When the build is completed, wait two to three minutes to allow the HEPA filter to remove any residual nanoparticles from the chamber. The build platform and parts can be hot immediately after the build is completed. Afinia provides safety gloves for protection when handling potentially hot components. The smaller components can be pried loose from the build platform using the utility tool provided with the Afinia printer. The base of the motor is constructed with a “raft.” This is a lattice of 3D printer filament placed on the build platform to prevent larger objects from coming loose from the platform during the printing process. If this occurs, the object will warp and will have to be discarded. This support material will need to be removed (i.e,. pried loose from the object) after the print is completed. Care is needed during this operation to avoid injury. Once the parts are printed, the linear motor can be assembled. Begin by gently tapping the four feet into the motor base. A plastic-coated craft hammer is useful for this operation. Place the base on the four feet. Then fit the end support pillars at the two ends of the base, and insert the two solenoid support pillars in the center. Placing the four feet over a support block (Figure 2.6) will prevent the base from bending during this operation. Figure 2.6 A support block can be useful when the end pillars are inserted. Place one of the U-shaped solenoid support extensions on each end of the solenoid spool. Then place the assembled solenoid assembly onto the two solenoid supports. Figure 2.7 The solenoid spool placed on the solenoid support pillars. 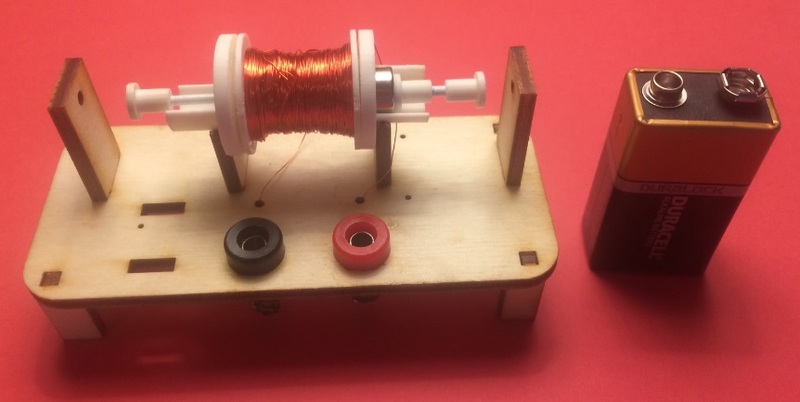 Once the linear motor has been assembled, it can be tested by connecting it to a battery. A test lead with an alligator clip at either end can be used to connect one end of the magnet wire wrapped around the solenoid spool to the negative terminal of a nine-volt battery. After a second test lead is attached to the other end of the solenoid wire, tap the alligator clip on the positive terminal of the battery. The current flowing through the solenoid wire generates a magnetic field. The electromagnetic field should cause the magnet of the armature to move within the solenoid tube. If the magnet does not move, it may be necessary to adjust the magnet slightly. Ideally the magnet should be positioned so that half of the magnet extends beyond the lip of the solenoid spool. Figure 2.9 A nine-volt battery can be used to test the linear motor. Once the current generated by the battery moves the magnet, reverse the leads connected to the battery terminals. This time the magnet should move in the opposite direction. The current flowing through the solenoid wire creates an electromagnet that has a north pole and a south pole. As you may recall from elementary science, like magnetic poles repel one another. Therefore if the north pole of the permanent magnet in the solenoid tube is aligned with the north pole of the electromagnet, the permanent magnet will move to the other end of the solenoid tube. Figure 2.10 Like magnetic poles repel one another. The permanent magnet will remain in this position until the leads of the battery are reversed. This will cause the current to flow in the opposite direction, reversing the poles of the electromagnet. When this occurs, the permanent magnet shuttles to the opposite end of the solenoid tube. By repeatedly reversing the terminals of the battery, the armature of the linear motor can be made to move back-and forth within the solenoid tube. When the direction of an electrical current repeatedly reverses and moves in alternate directions in this manner, it is known as alternating current. Figure 2.11 An amplifier used as a power source for the linear motor. Wave Lab is a waveform generator that can be installed on Apple tablets and smart phones. Equivalent applications are available for Android tablets and smart phones. Install Wave Lab or a comparable waveform generator on a tablet or smart phone. 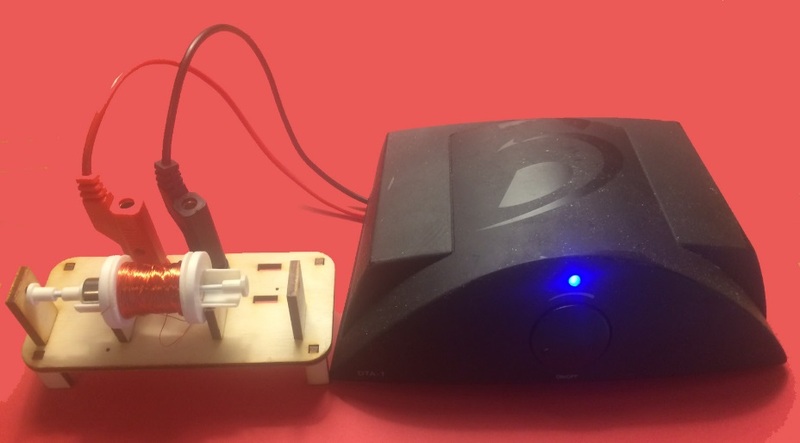 Connect the audio output of the tablet or smart phone to the linear motor via an amplifier. The audio output of a smart phone is not powerful enough to drive the linear motor by itself. Therefore the amplifier is used to increase the power available. Figure 2.12 A waveform generator can produce an alternating current. Set the frequency of the waveform generator to two cycles per second. The armature of the motor should move back and forth twice a second. Then increase the frequency of the waveform generator to ten cycles per second. The rate at which the motor moves should increase to ten times per second. By controlling the rate at which the current reverses, the rate at which the motor moves can be adjusted. This will be useful in subsequent labs, because it will provide a means of controlling the rate at which animated figures attached to the motor move. Now increase the frequency of the waveform generator to 400 times per second. The eye cannot detect movement that is faster than about twenty times per second. Therefore you will no longer be able to see the back and forth movement of the motor. However, you should be able to hear a high-pitched tone if you listen carefully and place your ear close to the linear motor. Vibrations created by objects that move at a frequency of more than about 60 times per second are perceived as sound. A speaker is simply a linear motor with a cone attached to amplify the sound. We will take advantage of this capability to fabricate a speaker in a subsequent lab.